Intense sampling of an estuary can reveal relative spatial changes that are significant irrespective of whether or not the estuary is eutrophic, micro- or meso-tidal, disturbed, or restored. This ‘waterscape’ perspective is analogous to a landscape perspective. We collected monthly water samples in the Barataria Basin watershed from 1994 to 2016 at 37 stations along a 129 km transect from 1 km offshore to a freshwater stream. The average Chlorophyll a (Chl) concentration from 267 trips was supported from both nitrogen-fixing cyanobacteria in a freshwater lake and partially from nutrients in seaward sources. Estuarine salinity was correlated with the discharge of the nearby Mississippi River. The main form of N was as organic nitrogen, not inorganic forms that recycle quickly, making changes in inorganic nitrogen concentration an unreliable indicator of net denitrification or uptake. The total nitrogen (TN) and total phosphorus (TP) concentrations declined with dilution towards the coast, but not because of denitrification. The phytoplankton standing biomass reflected the TN:TP ratio in the water column and there was a significant rise in the variability of Chl concentration at 2–6 psu, which was otherwise unremarkably constant. These waterscape patterns and cautionary interpretations may be common to other estuaries. The online version of this article ( https://doi.org/10.1007/s10750-019-3918-7) contains supplementary material, which is available to authorized users. Modern nutrient enrichment in estuaries and coastal waters is recognized as a causal agent of noxious phytoplankton blooms, fish kills, hypoxic zones, shellfish bed closures, and reduced coral reef and seagrass habitat (NRC, 2000; Cloern et al., 2001; Rabalais, 2002; Cloern & Jassby, 2008; Howarth et al., 2011). The enrichment is ubiquitous and has a well-documented global consequence. Bricker et al. (1999), for example, surveyed 138 estuaries in the US and reported that 60% of them exhibited moderate to serious nutrient enrichment problems. Numerous other examples are in Europe, Asia, and Australia (Zingone et al., 2010). Focused appraisals of these water quality changes are evolving to put the generic issue of biological eutrophication within a larger socio-politico framework (Cloern et al., 2001, 2016); the developing social consensus has resulted in the flourishing of some successful restoration measures (Duarte et al., 2009; Ruhl & Rybicki, 2010; Staehr et al., 2017). Water quality monitoring programs continue to track these changes and the consequences to help devise rehabilitation strategies and adaptations, and to evaluate new categories of change—climate, pharmaceuticals, dredging, and sediment diversions. Successful approaches to further understand the causes and consequences of coastal eutrophication and its reversal include quantifying the relative influences of nitrogen (N) and phosphorus (P) loading on the phytoplankton community through: (1) detailed examination of one estuary over many years, and (2) comparisons of many estuaries. One analytical benefit of single-system measurements is that dose–response inferences are more likely to be quantified where some variables are somewhat constant among years (e.g., geomorphology, flushing, salinity, temperature). The relationships between loading and response, however, are sometimes not transferable to other geomorphic settings, although the biophysical relationships may be developed for useful application elsewhere. However, long-term and whole system sampling from river to sea involves multiple sets of expertise, logistics, funding, and persistence to adhere to a strict set of sampling protocols, e.g., omission in sampling an upstream reach may compromise developing understanding of the downstream relationships. One potential benefit of a comparative approach could be to develop management policies for a suite of estuaries, and to uncover the influence of the variability in geomorphology or flushing characteristics that the first approach held constant. A striking example for freshwater systems was the watershed comparison by Vollenwider (1976) who showed a clear relationship between landscape loadings of P and the concentration of Chlorophyll a (Chl) pigments in a large variety of freshwater lakes. The results of a multiple-year sampling in one place, however, may become a means to document the impacts of unforeseen events (e.g., oil spills, climate change, hurricanes) if data accumulate long enough to become a baseline of absolute change. Intense sampling over many years may also demonstrate the existence of relative spatial changes from freshwater to sea. Estuaries—irrespective of whether or not they are eutrophic, micro- or meso-tidal, or disturbed by strong disturbances such as hurricanes—process elements and organisms within their geographical boundaries and also between adjacent ecosystems in sometimes discoverable and repeatable patterns. This perspective of how estuaries work and are studied is equivalent to a landscape perspective in terrestrial systems, and might be called a ‘waterscape’ perspective for estuaries. Wetlands, for example, are considered sites of active denitrification (Valiela & Cole, 2002) and nitrogen fixation is low in estuaries relative to freshwater lakes (Howarth et al., 1998). The nutrient concentrations along a salinity gradient from freshwaters to sea might, therefore, be expected to exhibit a significant decline in nitrogen concentration below that expected by seawater dilution if significant denitrification is occurring. But other factors are also important, such as loading rates, water residence times, doubling rates, predator–prey reactions, and light which result in distinctly different patterns in N, P, and Si within the same year and within the same estuary (e.g., Cloern & Jassby, 2008). Herein, we describe the results of a 22-year data collection effort spanning the entire salinity continuum from freshwater to sea within one coastal watershed—the Barataria Basin of southeastern Louisiana (described below). Some distinguishing features relevant to this study are (1) the watershed has a large wetland area that could hypothetically act as a temporary or permanent source (e.g., particle re-suspension or soil exchanges with water) or sink (e.g., sedimentation or denitrification) of elements in the water column when water floods the marsh intermittently, (2) agricultural sources potentially introduce significant amounts of nutrients to the watershed at the freshwater end, (3) a low flushing rate (e.g., tides are < 30 m; average depth < 1 m), (4) probable nitrogen fixation occurs in a freshwater lake, and (5) there is a potential for estuarine nutrient and salinity exchange with the Mississippi River. We collected water quality data in this eutrophic estuary to determine the total and dissolved forms of N and P that were coincidentally measured with turbidity, suspended sediments, Chl concentration, and other parameters. We summarized measurements for individual stations and for all stations combined and tested five hypotheses (HO): (HO1) variations in inorganic and organic N forms from one station to another reveal hot-spots of rapid changes in nutrient cycling, (HO2) denitrification rates, if significant, will be evident in the disproportionate decline in TN compared to TP; (HO3) variations in the Chl concentration and the frequency of algal blooms are coincidental with the molar TN:TP ratios the water column, (HO4) the system variance along the freshwater to sea continuum is constant, and (HO5) the offshore waters mix with inshore waters sufficiently to control estuarine salinity as measured by the gross changes from one year to the next. The 6,600 km2 triangular-shaped Barataria watershed is adjacent to the west bank of the Mississippi River in southeastern Louisiana, USA, and empties into the Gulf of Mexico (Fig. 1). The estuary is about 68 km wide at the southern end and is tidally influenced. The majority of freshwater entering it is from rainwater falling on six parishes whose total area is not all within the watershed. The major water bodies include the northern freshwater Lac des Allemands, the mid-watershed Lake Salvador and Little Lake, and Barataria Bay at the seaward end. The average water depth is 1.5 m and is normally unstratified. The mixed diurnal and semi-diurnal tides average 0.32 m at the coast and 0.03 m in Lac des Allemands, and can be significantly modified by wind. 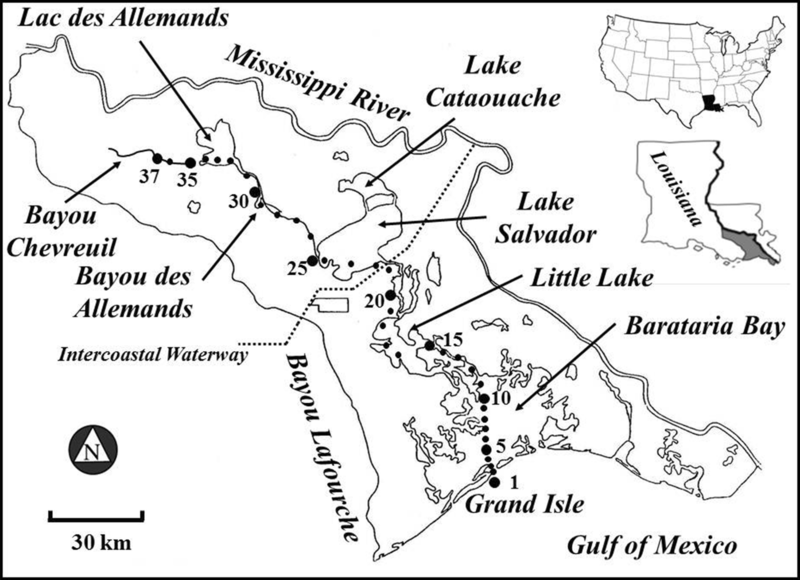 Some of the Mississippi River discharge from Southwest Pass mixes within the estuary at Caminada Pass, Barataria Pass, Pass Coup Abel, and Four Bayous Pass to alter the salinity of the lower Barataria Bay and also brings an additional nutrient loading to the estuary (Wiseman et al., 1990; Wissel et al., 2005). The pulse residence time, defined as e−1 (63% removal), is 50 to 70 days in the middle of Lac des Allemands, 100 days in Lake Salvador, 20–30 days in Little Lake, and 1–4 days in Barataria Bay (Das, 2010). The 4,783 km2 of land in the Barataria watershed is about 16% agriculture, 9% urban, and 75% wetland (Bricker et al., 2007). The agricultural area north of Lac des Allemands is almost entirely sugarcane agriculture (Lindau et al., 1997). The agricultural area to the south is on mostly on the western boundary, and the southern end is bordered by barrier islands. The emergent wetland is fresh, brackish, and salt marsh habitats with some mangroves. Twenty-nine percent of the wetland area was lost after 1932, but was stable from 1995 to 2016 (Couvillion et al., 2017). An analysis of diatoms in sediment cores dated for the last century revealed no significant gross long-term trends in salinity, but indicated a rise in eutrophication as nutrient loading increased dramatically from the mid-1960s to the mid-1970s (Parsons et al., 1999, 2006). Nitrogen loading in the watershed in 1987 was three times greater than from the combined inputs from wastewater treatment plants, and urban and industrial sources (NOAA, 1998). The estimated N and P fertilizer use in the watershed began after 1945, rose dramatically in the 1960s, and was statistically stable from 1994 to 2006; phosphorus fertilizer consumption (sales), however, declined about 25% since 1987 to 2006 (Supplementary Fig. S1). A national survey of eutrophication in estuaries (NOAA, 1997; Bricker et al., 2008) classifies the Barataria estuary in the ‘moderate high’ eutrophication’ category for Chl, indicating that the average concentration of Chl in 1997 was between > 20 and < 60 µg l−1. We used small boats to collect surface water (< 0.5 m) in 1-l Nalgene bottles that were pre-rinsed in the laboratory with distilled water and then with sample water in situ. There were 37 water quality sampling stations located along a transect aligned in a southeast to northwest direction (Fig. 1). The sampling started after daybreak at 1 km offshore of Grand Isle, Louisiana, continued north through the Barataria Waterway, into a dredged channel on the west side of Barataria Bay, via Bayou St. Denis into Little Lake, into Bayou Perot to Lake Salvador, via Bayou des Allemands to Lac des Allemands (aka Lake des Allemands), and then into Bayou Chevreuil where it ended. The entire sampling trip took about 5.5 h to traverse the 129 km distance from offshore to the most inland station where the inside of the tidal pass was defined as 0 km. The distance between stations averaged 3.7 ± 0.07 km. We collected samples monthly from January 1994 to December 2016 for a total of 267 monthly regular trips and 4 additional bi-monthly trips. Inclement weather or boat break-downs occasionally prevented sampling about once every other year. There are 9,941 water samples with a successful determination of Chl concentration included in this analysis, which equals a 99.7% sampling success rate. Similar sample numbers and analytical success rates were obtained for all water quality analytical determinations. The water quality meters used in the field were checked against a laboratory standard for conductivity before each sampling trip. All laboratory analysis followed Good Laboratory Practice. Analyses were checked verified using standards, blanks, and analytical replicates. Salinity (psu) was measured from January 1994 through November 1996 in the laboratory with a digital chloridometer, and from December 1996 through March 2004 in the laboratory with a YSI Inc. (YSI) conductivity/temperature meter. Starting in April 2004, a handheld YSI field instrument was used to measure temperature, conductivity, and salinity in the field. Suspended sediment matter (TSS) was filtered through pre-weighed grade C borosilicate glass fiber filters (1.1 μm) that were pre-combusted at 550°C for 1 h. The post-filtration filters were first dried at 60°C for 24 h, and then weighed to the nearest 0.001 g to determine the total suspended matter (TSS). Each filter was then heated to 550°C for 1.0 h, and then re-weighed to determine the amount of inorganic and organic suspended matter. A Secchi disk (SD) was used to measure light penetration (cm). We kept unfiltered water samples frozen until determination of the concentration of dissolved forms of nitrogen (N), phosphorus (P), and silicate (DSi). A Technicon Autoanalyzer II was used from January 1994 through December 2000 using USEPA Method 353.2 for ammonium and nitrate/nitrite, USEPA Method 365.2 for phosphate (DIP), and Technicon Method 186-72 W/B for silicate. The analyses after January 2001 were done with a Lachat Quick-Chem 8000 Flow Injection Analyzer using the Lachat Methods approved by USEPA: method 31-107-06-1-B for ammonium, method 31-107-04-1-C for nitrate/nitrite, method 31-115-01-1-H for phosphate (DIP), and method 31-114-27-1-C for DSi. A 5-point standard curve was used and QC standards were analyzed before, during, and after each set of samples analyzed. The concentrations of total nitrogen (TN) and total phosphorus (TP) were measured using a Technicon Autoanalyzer II or LaChat Quick-Chem after persulfate wet oxidation digestion (Raimbault et al., 1999). Two QC standards were digested with each set of samples to measure recovery. TN recovery was 102% and 102%, while the TP recovery was 100% and 107%. The concentration of Total Carbon (TC) was measured by employing High Temperature Catalytic Oxidation (HTCO) using a Shimadzu® TOC-5000A Analyzer. The machine operates by combusting the water sample (at 680°C) in a combustion tube filled with a platinum–alumina catalyst. The carbon in the sample was combusted to become CO2 which was detected by a non-dispersive infrared gas analyzer (NDIR) to give the total amount of carbon in the sample. Total Organic Carbon (TOC) was measured in the sample by acidifying with HCl then sparged before analysis to remove the inorganic Carbon (IC). The concentration of dissolved nitrogen (DIN) is the sum of the dissolved nitrate + nitrite and ammonium concentrations. The total organic nitrogen (TON) is the difference of the TN and DIN. The Coefficient of Determination for the standard curve was > 0.98 for all nutrient analysis. Water for the Chl sample was filtered through Grade F borosilicate glass fiber filters (0.7 μm), the filters fixed in 5 mL of dimethyl sulfoxide–90% acetone (40:60 by volume), and then the Chl was extracted for at least 2 h in the dark (Lohrenz et al., 1999). The extracts were measured on a Turner Model 10 fluorometer before and after acidification with 10% HCl (Parsons et al., 1984). The fluorometer was calibrated for Chl against a chemical supply house standard measured on a spectrophotometer, and was checked for each analysis using the manufacture-supplied stable solid standard. Only the total Chl concentration is reported here. The average % difference for replicate Chl values was 4.68%. The data were averaged and the standard error of the mean (µ ± 1 SEM) for each analyte was calculated for each year and by station and then plotted as a function of distance to the sea or salinity. These visual inspections of the data were intended as a first examination to find errors, then locations of general trends, and locations of unusual activity. The salinity values in samples from Barataria Bay stations #3-7 were averaged for each year and compared to the annual discharge of the Mississippi River at Tarbert’s Landing, LA (https://toxics.usgs.gov/hypoxia/mississippi/oct_jun/index.html) using a linear regression using the analytical program in Prism 6.0 software to test if there were significant slopes (% year−1). A second-degree polynomial fit was made to test for the relationship between the salinity at all stations and in Barataria Bay, and a linear regression made to test for the relationship between the average annual salinity versus year. 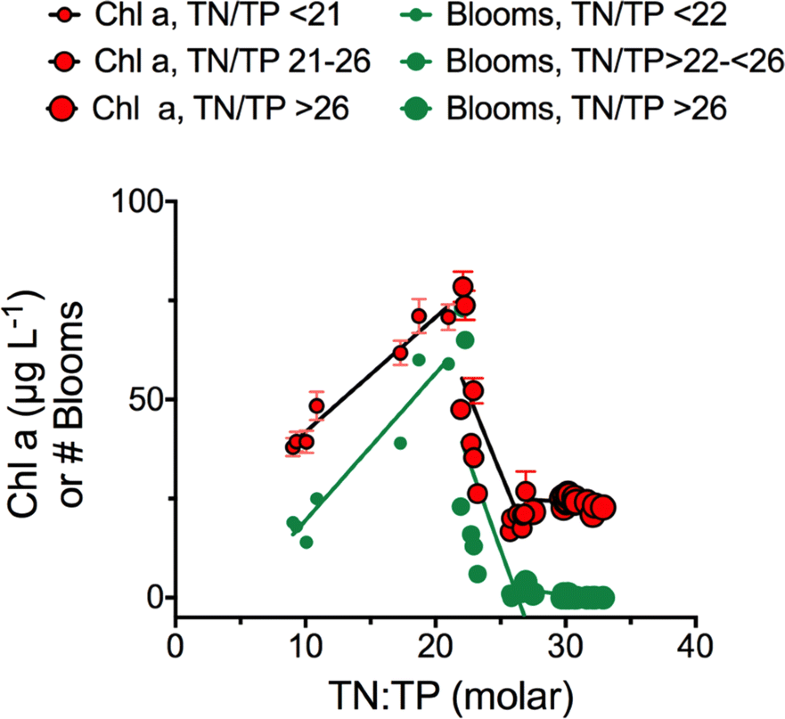 A linear regression of the concentration of TN, TOC, TP, and TN:TP molar ratio was made against salinity to test for indications of changes that were independent of dilution, e.g., denitrification, nitrogen fixation, and sedimentation. The mixing model for the dilution of TN and TP along the salinity gradient had a freshwater end-member that was the average concentration at station 24 (salinity > 1 psu) and the salinity end-member at the offshore Station 0. The slopes of each regression equation were compared for station groups that had a salinity that was either higher and lower than 1 psu. The number of algal blooms with a Chl concentration > 100 µg l−1 in each month was calculated for the entire sampling period to determine the seasonal frequency of blooms and then compared the total number of blooms in each station as a function of the TN:TP concentration. The DIN:DIP ratios for each station were compared to the DSI:DIN ratios to test for evidence of coherence with distance and salinity. A linear relationship of the average Chl a concentrations at each station vs. the average TN:TP molar ratio was made for three data groups: where TN:TP molar ratio was < 22, between 22 and 26, and > 26. These divisions were made based on the visual inspection of the data. We calculated the coefficient of variation (mean/1 standard deviation = COV) for the average annual Chl concentration at each station to create a non-dimensional index of variability among stations. The average salinity for an individual station ranged from 0 to 21 psu, and the most northerly station with an average annual salinity > 1 psu was station 23, located 69 km inland (Fig. 2A). The annual average temperature at any station was 22.5 at the coast and 23.5°C at the end of transect (Fig. 2A) (Y = 0.00813 × distance + 22.5; n = 37, P < 0.0001, F = 40.3) and had an average SD depth at all stations ranging between 0.40 and 0.90 m (Fig. 2B). The average SD depth of 0.87 m at station 1 declined to 0.41 m in the middle of Barataria Bay, rose to its maximum in Lake Salvador, was higher inside compared to outside of Lake des Allemands, and then reached its lowest value in Bayou Chevreuil (Fig. 2B). The average TSS concentration was roughly a mirror image of the SD depth (annual average = 0.46 to 0.70 m), and ranged between 20 and 35 mg l−1. The two stations with the highest SD (#23 and 24, Lake Salvador) had an average salinity of 0.85 psu, which was at the boundary of the salinization of the estuary. A comparison of linear regression equations for SD vs. average station salinities < and > 1 psu revealed that the intercepts were different (P < 0.001; F = 76.7), but that the slopes were equal (P = 0.69; F = 0.16). 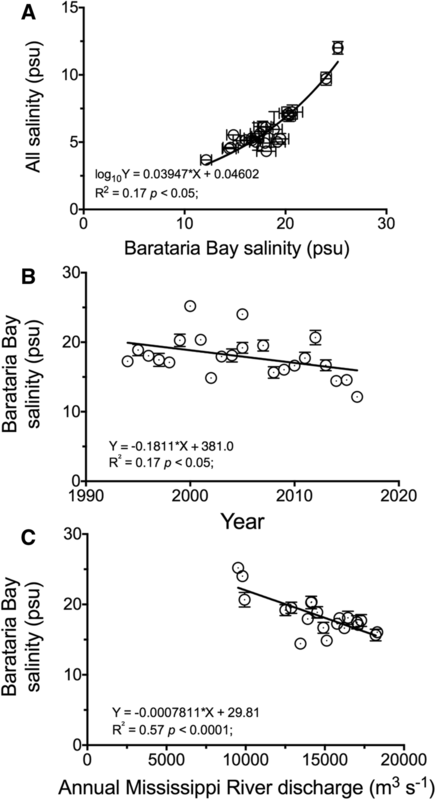 The variance in the annual salinity in Barataria Bay is shown in Fig. 3 in three different ways. The annual average salinity for all stations tracks the salinity in Barataria Bay (Fig. 3A), and the latter declined slightly over the 22 years of sampling (Fig. 3B). The annual average salinity in Barataria Bay was strongly correlated with the annual discharge of the Mississippi River at Tarbert Landing, LA (Fig. 3C; R2 = 0.57; P < 0.001). The average concentration of TN in water entering Lac des Allemands (stations 35-37, 120 km) was 76.5 ± 1.8 µmol l−1 compared to 99.5 ± 2.7 µmol l−1 in the lake, and then declined gradually to 36 ± 1.2 µmol l−1 N at the estuarine entrance (station 2, Fig. 4A). The concentration of Chl (µg l−1) rises and falls coincidentally with the concentration of TN along freshwater half of the transect. An average of 83% of the TN at all stations was in an organic form (TON; Fig. 4B). The concentration of DIN and nitrate + nitrite (µmol l−1), however, varies in a different pattern than that of the concentration of TN (Fig. 4B). The pool of DIN was higher at the northern end of the transect than in Lac des Allemands, rises leaving Lac des Allemands until the middle of the transect, then drops again to its lowest point at the southern end of Barataria Bay, before rising again offshore. The concentration of DIN, but not Chl or TN, was higher for water on either side of the middle of Barataria Bay. The average concentration of all ammonium values was 18% of the average size of the DIN pool, and the variation along the transect was about twice as high in the freshwater end compared to the southern marine end of the transect. The net changes in the nitrogen pool, therefore, occurred in organic not inorganic form, and mimic the changes in Chl concentration. 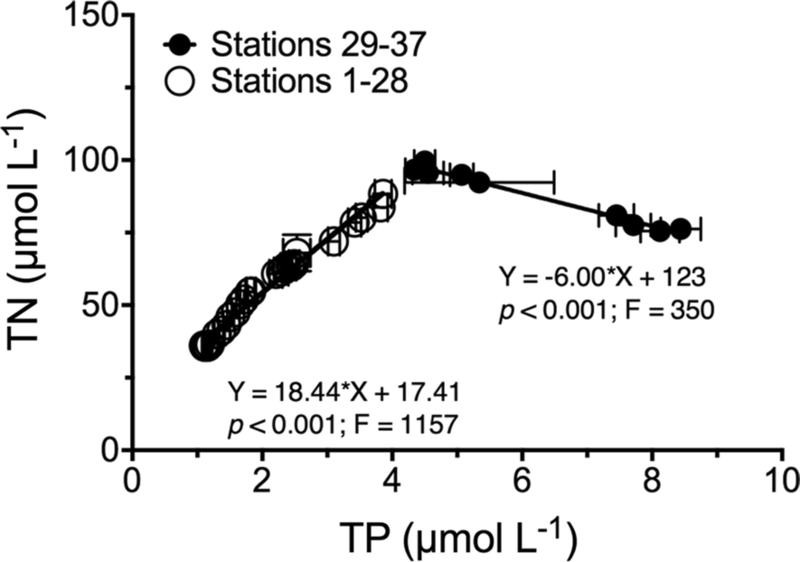 The concentration of TP declines from about 9 µmol l−1 going into Lac des Allemands to 1 µmol l−1 at the estuarine entrance and without the various rises and falls as for the DIN and Chl concentrations (Fig. 4B, C). The concentration of DSi declines without significant rises from around 85 µmol l−1 DSi in Lac des Allemands to around 25 µmol l−1 at the estuary entrance (Fig. 4D). The changes in DSi and DIP concentrations decline along the transect, unlike the various forms of inorganic nitrogen. The average TN, TP, TOC concentrations for all years and the corresponding TN:TP molar ratio for each station are plotted versus salinity in Fig. 5. The concentration of TN drops precipitously from > 80 µmol l−1 in water leaving the freshwater Lac des Allemands to < 60 µmol l−1 entering Little Lake, and then declines steadily with increasing salinity until it enters Barataria Bay at around 50 µmol l−1 (Station 12; Fig. 5A). The concentration of TN where psu > 5 traces a salinity mixing line and is without a significant sag beneath it, implying no significant net uptake or loss of TN. The concentration of TN as water moves from freshwater to sea from mixing alone would be 59% of the TN concentration in the freshwater end-member at station 23, which is almost equal to the measured 54% reduction. The molar ratio of TN:TP was about 25:1 in Lac des Allemands, but rises only slightly to 30:1 from between about 2 psu to 22 psu. 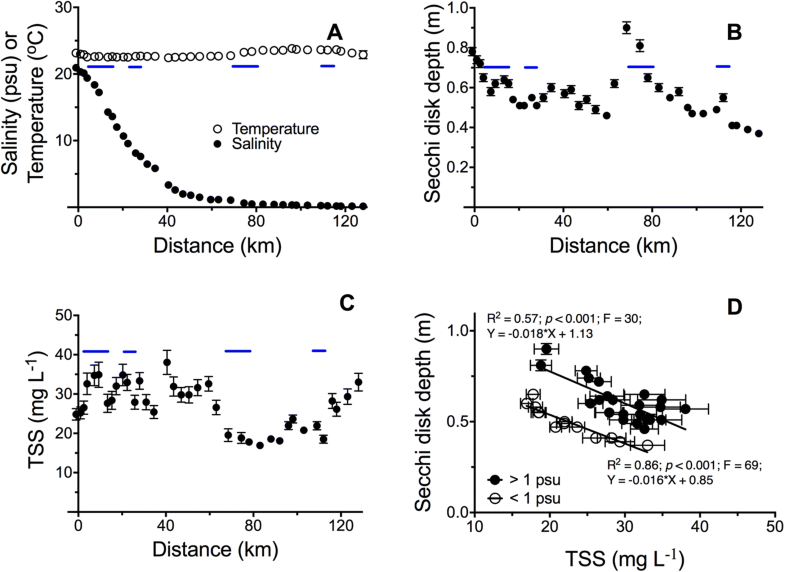 The pattern in the TP concentration with salinity mimics that of TN, but the concentration of TOC was flat at 2 to 3 mg l−1 for the entire transect (Fig. 5B). The concentration of TN and TP co-varied with each other within two different station groupings (Fig. 6). They changed coincidentally for the stations below the main channel draining Lac des Allemands with a molar ratio of TN:TP::18.4:1, but with a negative slope from Stations 29–37 (TN:TP::− 6.0:1, which includes water entering Lac des Allemands, in the lake, and 5 stations downstream of the lake. This negative ratio reflects the nitrogen fixation within Lac des Allemands and the loss of P.
The interannual average Chl concentration for all stations was 34.4 ± 0.4 µg l−1, with a median value of 23.3 µg l−1. The Chl concentration in Lac des Allemands varies by two-fold from 1994-2016, with the lowest values from 2002 to 2012. There were 372 Chl concentrations values in samples collected over the 22 years that exceeded 100 µg Chl l−1, amounting to 4.6% of the total measurements for all samples, and an average of 16 events annually (Fig. 7). These 372 values, when parsed into monthly counts, had the highest counts from April to August which comprised 87% of all of the high Chl concentration samples. 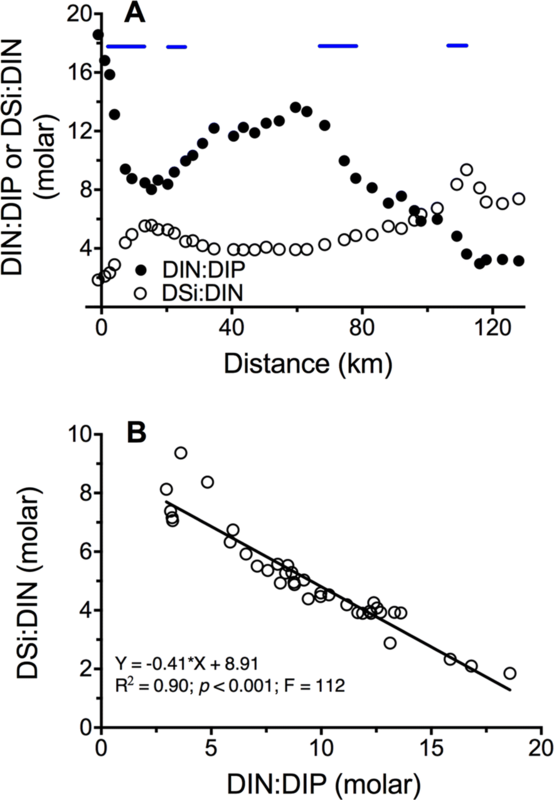 The patterns along the transect for the molar ratios of DIN:DIP and DSi:DIN were dissimilar a mirror image of each other (Fig. 8). The molar ratio of DIN:DIP rose from 3.2:1 in waters at the northern end of the transect, rose after leaving Lake Salvador, fell to 8 to 9 in the middle of Barataria Bay, and rose to 18:1 at the southern offshore end, whereas the DSi:DIN ratio mirrored these variations, but never fell below 1:1 (Fig. 8A, B). The average Chl concentration at each station (for all years) is plotted against the average TN:TP ratio (for that station in all years) in Fig. 9. 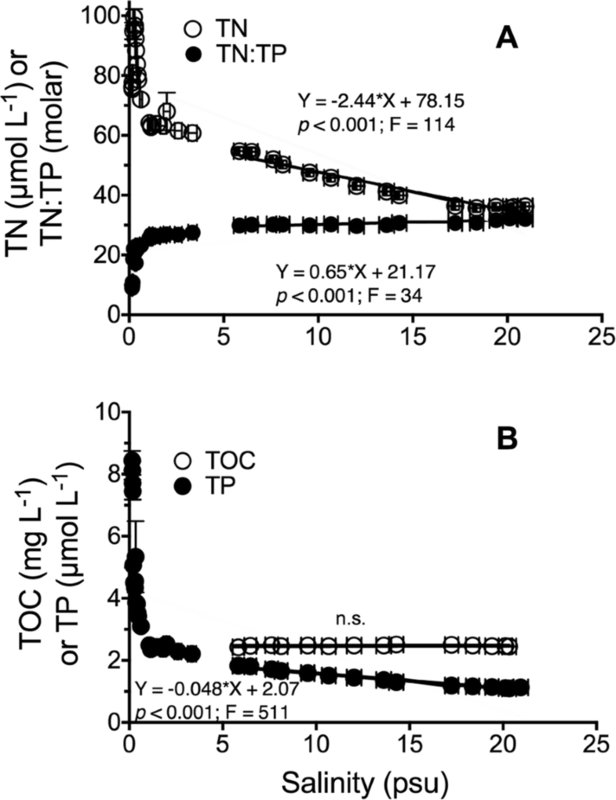 The Chl concentration peaks at 80 µg l−1 at a TN:TP ratio of 18:1 to 22:1, and was about one-third of that Chl value below a TN:TP ratio of 10:1, and one-fourth that value at a TN:TP value > 25:1. The shape of the curve was not symmetrical around the peak in TN:TP. There were an average of 20.8 ± 3.1 bloom events each year. The number of events (Chl > 100 µg l−1) over the 22 years were non-existent when the TN:TP ratio was > 25:1, rose sharply to peak where the TN:TP ratio was between 18:1 to 22:1, and dropped to about 20 events (over 22 years) at a TN:TP ratio of 10:1. 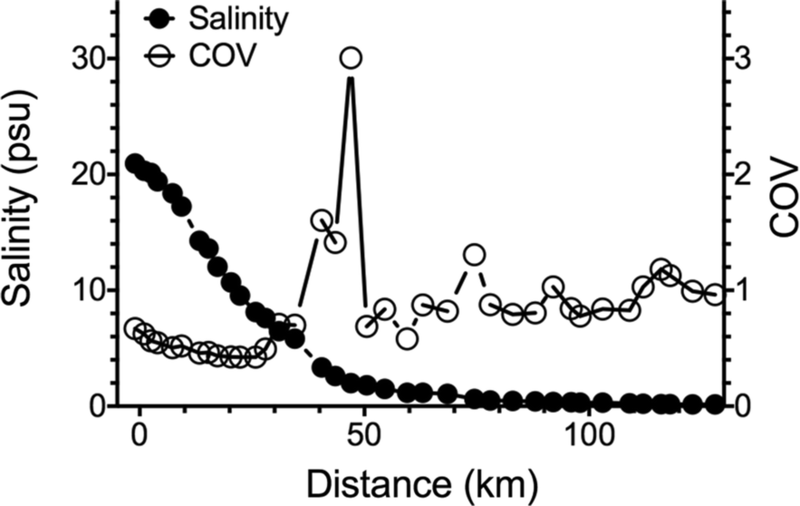 The COV, a non-dimensional index, for the average Chl concentration at each station peaked at about three times the average where the average station salinity increased from 1 to 3 psu (Fig. 10). The COV of the average concentration of Chl for freshwater stations was about 20% higher than for the marine stations. This geographic location is the same as where the SD vs. TSS lines were separately grouped (Fig. 2). An analysis of water quality data is presented for 22 years of monthly sampling at 37 stations along a transect a watershed that went from a freshwater stream to the ocean. The concentration of Chl over the 22 years averaged 34 µg Chl l−1 for all stations, and algal blooms > 100 µg Chl l−1 were measured in about 5% of all samples. These values are high relative to other estuaries. Cloern & Jassby (2008), for example, assembled data on the Chl concentration for 154 estuaries, of which 84% were less than 10 µg Chl l−1, fewer than 10 were > 20 mg l−1, and the median value of 151 of the 154 estuaries were below the Chl concentrations measured here (28.4 µg Chl l−1; COV = 1.16). That amount in the Barataria watershed was higher than in the Baltic Sea, Chesapeake Bay, and San Francisco Bay (Cloern & Jassby, 2008). 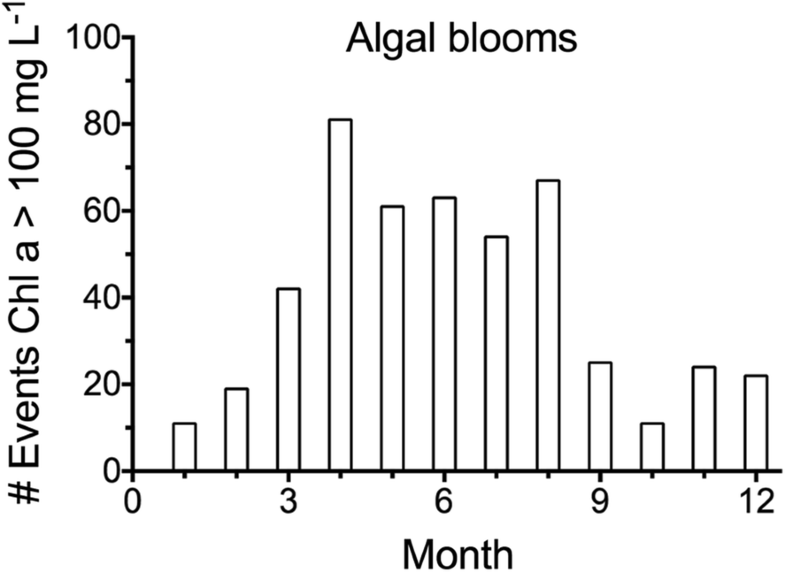 The peak algal biomass for all of the sites in their meta analysis (n = 116) was in May, as it was for in Barataria Bay. The data collected were used to discuss the five hypotheses below. There were three locations where nutrient cycling was relatively active when compared to all stations. At the northern end of the transect, the maximum amount of total nitrogen in Lac des Allemands (station 33) was 41% higher than the TN concentration in water entering from Bayou Chevreuil (Stations 34 to 37), but the amount of carbon in the lake was 29% lower. The average Chl concentration in Lac des Allemands (station 33) was twice that in Bayou Chevreuil, but the total phosphorus concentration was lower by 44%. These observations are consistent with those of Butler (1975) and Stow et al. (1985) who ascribed the increase in TN concentration to nitrogen fixation by the Anabaena spp. and other cyanobacteria forming blooms (Ren et al., 2009; Garcia et al., 2010), and the TP decrease to P sedimentation in the lake which appears as a higher P concentrations in the shallow layers of dated sediment cores (Stow et al., 1985). The second and third sites of relatively rapid nitrogen recycling were in the middle of the transect and in Barataria Bay. Evidence of this is that the TN pool decreases in water leaving Lac des Allemands and all the way to the estuary entrance, but the concentration of DIN at the mid-point of the transect was about four times higher than in Lac des Allemands or Barataria Bay. Second, the concentration of DIN decreases from this peak as water moves seaward, and then increases again at the estuarine entrance, whereas the TN continues to decrease while the concentration of Chl stabilizes in spite of grazing, sedimentation, and dilution as it moves towards the ocean. This pattern is consistent with the rapid recycling of N from algal decomposition, and then uptake of nitrate from phytoplankton production as water enters the lakes from the north or into the estuary from the sea. The mixing of offshore waters within the estuary brings nutrients into the estuary, especially nitrate, some of which were then converted to organic nitrogen. The DIN concentration in the river (40 to 230 µmol l−1) fluctuates with discharge and land use (Turner et al. 2007) and is diluted by oceanic water as it moves from the delta mouth to along the coast to the estuarine entrance (2–15 µmol l−1) where it mixes during tidal flushing and storms. Wissel et al. (2005) analyzed stable isotopes to characterize the particulate carbon (POC) in the monthly samples discussed herein for three years (from August 1999 to September 2002). They concluded that the POC was about 70% algal carbon sources with some sedimentary sources and confirmed that nutrients were brought into the bay through tidal passes. The concentration of TN, TP, and Chl declines gradually towards the coast with a TN:TP molar ratio from station 28 to the coast of 18.4 (R2 = 0.95), indicating a relatively equal loss of TN and TP. The conservative mixing of TN with seawater and the relatively stable TN:TP molar ratio for stations along the transect from freshwater to sea support the conclusion that the net effect of denitrification after leaving the lake was minor, and that the net declining concentration of TN was from dilution, but not denitrification. These results are, therefore, consistent with the observation of Douglas et al. (2018) who found that “denitrification enzyme activity was suppressed by nutrient enrichment.” in a New Zealand estuary. 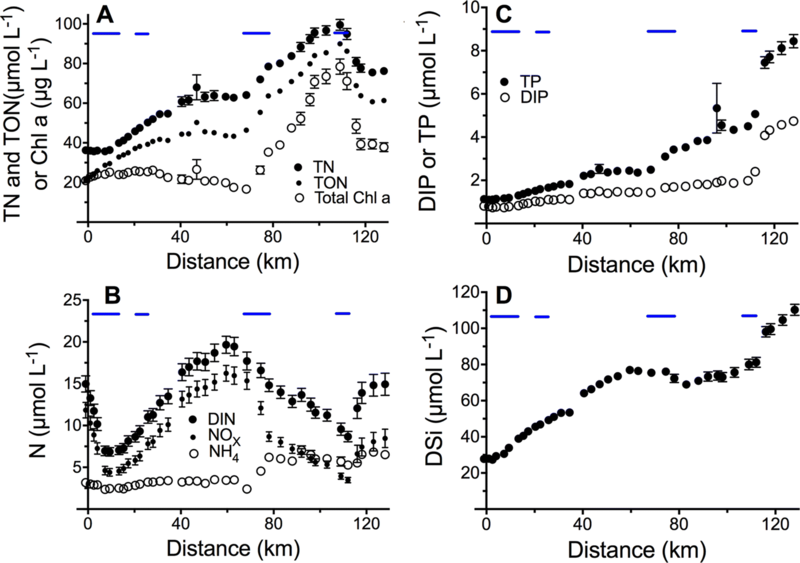 Most of the TN was in the dissolved organic fraction (DON), and so it is clear that a complete accounting of nitrogen inputs, recycling, and outputs must include measurements of the movements of TN between inorganic and organic forms. The decrease or increase in nitrate concentrations along the transect, therefore, does not inform analyses of either denitrification rates or nutrient uptake by the surrounding wetlands. These interpretations of the data are consistent with the advice of Collos (1992) and Dodds (2003) who emphasized the necessity of analyzing samples for a complete nitrogen budget. The observed changes in DIN and DON are also consistent with the observed minor denitrification rates estimated in Lake Pontchartrain after the 1997 Bonnet Carré diverted enough Mississippi River water into it to fill it twice within one month (Turner et al., 2004). The peak in Chl concentration and the annual algal bloom number occurred at a TN:TP ratio of 20:1 to 22:1 for stations located within a few km of stations with a lower ratio that are located at the freshwater end of the watershed (Fig. 9). This peak reveals an elemental constraint on the physiological demands of photoautotrophs (Turner, 2002; Elser et al., 2007). We know that nitrogen is fixed in Lac des Allemands because the TN concentration rises going into the lake as the concentration of TP declines during sedimentation (Fig. 4A, C) and that the TN:TP atomic ratio rises as a result (Fig. 5A). Ren et al. (2009) conducted seasonal phytoplankton nutrient limitation experiments in twelve 10 l mesocosms using natural phytoplankton assemblages from October 2003 to July 2004. Dissolved inorganic nitrogen (N), phosphorus (P), and silicate (Si) were added with different combinations at Redfield ratios. Nitrogen was found to be the sole or primary growth limiting nutrient in all 12 experiments, but N and P co-limitations were found in seven of them and growth limitation by phosphorous was never determined to be the sole limiting nutrient. The relatively high concentration of N or P does not necessarily indicate whether N or P controls growth limitation in these lakes by themself. It appears to also involve nutrient loading ratios. Nutrient limitation in the offshore mixing end-member seems to be similar to the freshwater member. 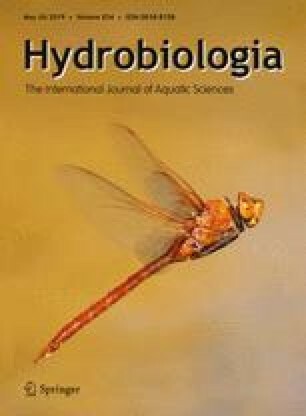 Turner & Rabalais (2013), for example, conducted 158 bioassays determining phytoplankton growth limitation offshore of Barataria Bay and further westward. Phytoplankton biomass yield when not light limited were stimulated by N or a co-limitation of N plus P (N + P). N limitation was 5 times more frequent than P limitation in these bioassays. The interaction of N and P co-limitation was frequently synergistically additive. The in situ dissolved inorganic N: P ratios were not reliable chemical boundaries describing likely areas of exclusive N or P limitation in these bioassays. Based on these data and others, they concluded N reductions were a prudent remedial action to decrease the size of the nearly annual ‘dead-zone,’ but that the omission of a concurrent reduction in P loading would be shortsighted. Thus, reducing both N and P in the upper or lower watershed also seems a prudent management recommendation. The highest variability in the concentration of Chl within the entire system appears to be where the freshwater system was subject to the dilution of brackish waters between 2 and 6 psu. This higher variability, which was about twice that of the other stations, may be the result of the physiological stress as freshwater organisms were exposed to salt at stations 18–33. It is also where the ratio of TN:TP changed significantly. The annual average salinity in Barataria Bay declined as the Mississippi River discharge increased (Fig. 2). This relationship in the estuarine bay changed the salinity along the transect, which decreased over the 22 years of salinity measurements. These results are consistent with the observations of Wiseman et al. (1990) who found that the average annual salinity recorded in north Barataria Bay also declined from 1963 to 1985, and was inversely related to the discharge of the Mississippi River. Parsons et al.’s (1999) analysis of salinity-tolerances for buried diatoms over 100 years showed “no evidence for a coastwide increase in salinity.” We conclude, therefore, that there was no evidence for a system-wide salinization of Barataria Bay over the last 100 years, and agree with Wiseman et al. (1990) about salinity regime in the estuary being controlled by tidal exchanges through estuarine passes. The Barataria Bay estuary does not seem, therefore, to have undergone a system-wide salinization at the lower end. The major factor contributing to the high phytoplankton biomass in this estuary is nutrient loading from agricultural land use that drives blue-green N-fixing algae in the northern end, and is sustained, in part, by the exchange of partially diluted Mississippi River water through barrier island passes to the south. This mixing of nearshore waters with estuarine waters brings salt and nutrients into the estuary; the salt has a general controlling influence on estuarine salinity and the nutrients sustain phytoplankton growth, which has clear implications for nutrient load reductions—it requires attention to reducing both the inshore and offshore nutrient sources. The annual number of algal blooms and Chl a concentration peaks around an N:P ratio of 22 that is strongly influenced by agricultural land use. The apparent absence of net denitrification is stunning, given that there is more area of wetland compared to water surface and this is a warm subtropical climate. The recycling rate is rapid enough that using inorganic concentrations to track denitrification is obviously inadequate, if not misleading. Eutrophication in this estuary may be reduced if nutrient loading declines, of course. Nutrient reductions for other systems have been successful, but perhaps not reversing along the same trajectory path occurring during eutrophication (Kemp et al., 1990; Greening & Janicki, 2006; Duarte et al., 2009; Staehr et al., 2017). We thank the 72 + students, staff and faculty who assisted water sample collection and laboratory analyses, including G. Peterson and T. Oswald. This analysis was possible because of multiple funding sources over 22 years, including from the NOAA Coastal Ocean Program MULTISTRESS Award No. NA16OP2670 to Louisiana State University, NSF Rapid Grant DEB-1044599, Northern Gulf Institute, contract CPRA-2015-TO35-SB01-MB from The Water Institute of the Gulf, funding by the Louisiana Coastal Protection and Restoration Authority, and from a Gulf of Mexico Research Initiative grant to the Coastal Waters Consortium. The data are available through the Gulf of Mexico Research Initiative Information & Data Cooperative (GRIIDC) at https://data.gulfresearchinitiative.orgdata/R4.x264.000:0018. Couvillion, B. R., H. Beck, D. Schoolmaster & M. Fischer, 2017. Land area change in coastal Louisiana 1932 to 2016: U.S. Geological Survey Scientific Investigations Map 3381, 16 p. pamphlet, https://doi.org/10.3133/sim3381. NOAA, 1997. NOAA’s Estuarine Eutrophication Survey. Volume 4: Gulf of Mexico Region. National Oceanic and Atmospheric Administration, National Ocean Service, Office of Ocean Resources Conservation and Assessment. Silver Springs, MD. http://www.eutro.org/documents/gulfofmexicoregional report.pdf. http://www.eutro.org/. NOAA, 1998. Coastal Assessment and Data Synthesis system. Online database of estuarine and watershed physical and hydrological characteristics, eutrophication condition information, nutrient loadings, land use. http://cads.nos.noaa.gov.